Regardless of the climate you live in, there are many reasons, ranging from style to function, for investing in a covered patio. These days, patio covers go by many names — pergola, trellis, canopy — and they all qualify as stylish patio covering options. Whatever your #patiogoals, there are plenty of ways for you to be imaginative. Whether you're looking for complete shade coverage, full sun exposure, or something in between, get ready to be inspired by these 13 creative ways to cover your patio. Basically a dining room with its exterior walls knocked out, this covered patio is the perfect spot for dining al fresco. The exposed beam design creates a 'built-in' look by using building materials and design elements that integrate seamlessly with the rest of the house — no one will ever know it's an add-on. Well, it will not protect you from rain or snow, but yes, this narrow-slat pergola frame counts as a covered patio. Perfect for the homeowner that enjoys basking in the sun's rays, the uncovered-covered-patio option will provide a little bit of shade while still allowing you to soak up lots of vitamin D. We particularly like the semi-private cabana effect that results from the addition of a wraparound screen. And if you're ever in the mood for an ambitious DIY project, framing a patio roof may not be as hard as you think. 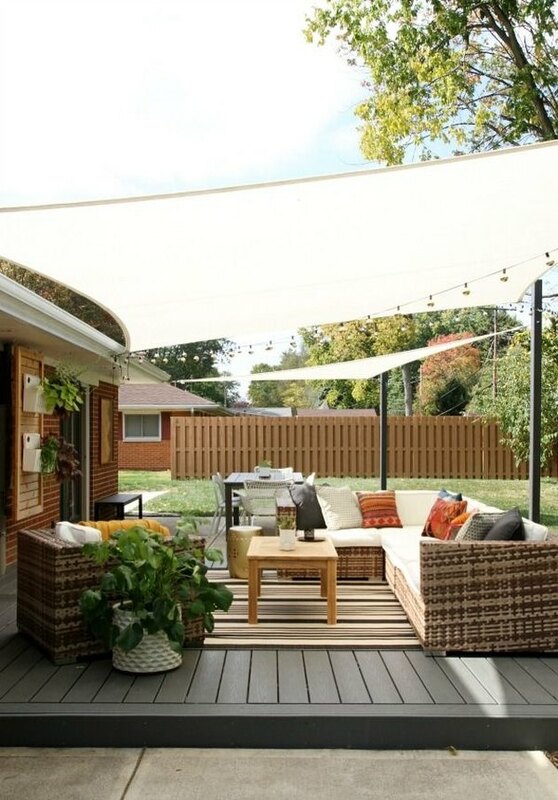 This metal canopy, reminiscent of a midcentury home carport, is a beautifully modern patio cover solution. The simple architectural framing provides a perfect complement to this modern outdoor veranda's minimalist color scheme. This wood slat patio cover instantly creates a warm and rustic vibe. 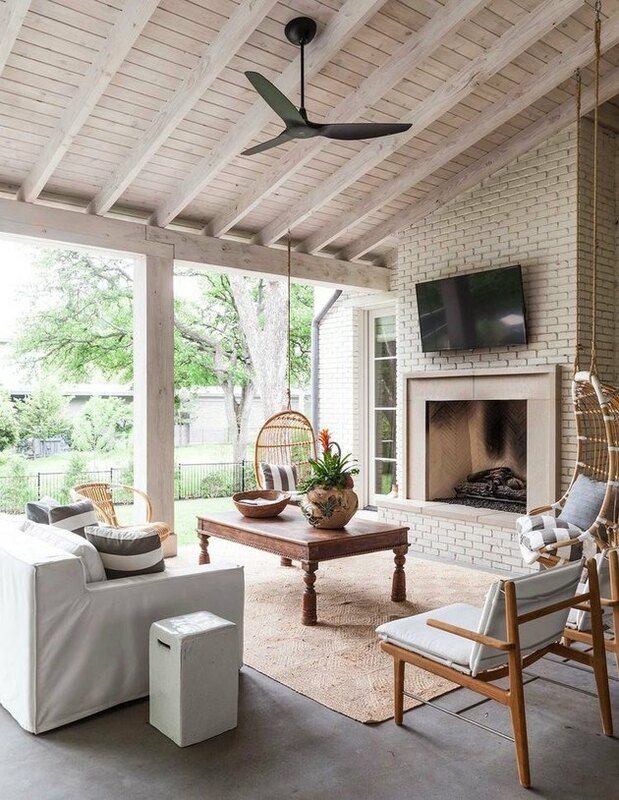 The light-colored wood finish paired with the white brick fireplace are ideal for exteriors in super hot climates, but that's not to say they can't work beautifully in cold ones as well. Just imagine curling up in front of that fireplace with some cozy blankets and a hot cup of cocoa as the temperatures get a little cooler? Chances are this isn't your grandma's patio cover (but if it is, you've got one awesome grandma). 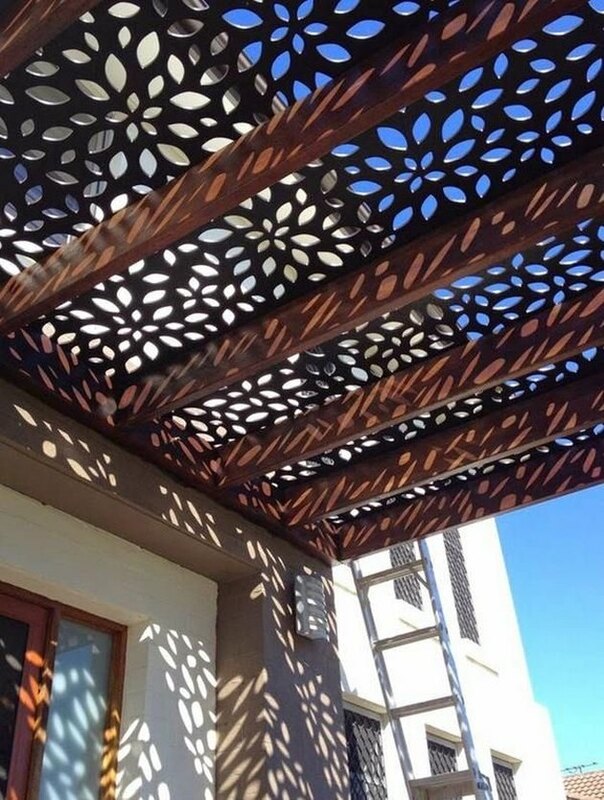 Laser cut metal screens are one of the most creative, not to mention visually interesting, ways you can cover your patio. Not only are the screens themselves beautiful, but they also cast incredible shadows with the changing sunlight. Due to the craftsmanship involved, it's not surprising that this particular option is available at a higher pricepoint than the average patio roof. This lush, vine-covered trellis is pure boho-chic magic! We love that you can take your trellis to a whole new level by loading up on greenery until you've got a living canopy. Add a few simple pieces of furniture to balance out the wild verdure, and you can always string some outdoor fairy lights for a little added ambiance. Sail shades are an especially creative way to cover your patio, because they provide endless possibilities. Depending on how you install them, you can reposition the sail shades at anytime. 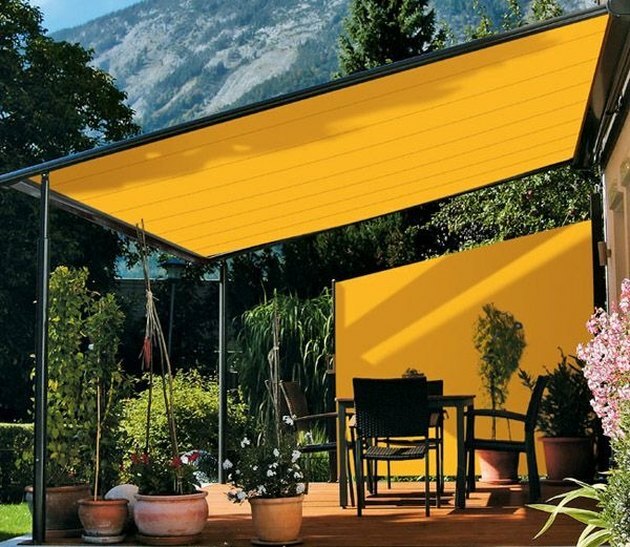 You can even experiment with multiple shades, colors, and configurations ensure you have the most original and unique patio cover on the block. Unlike sail shades, fixed shades are attached to metal frames and cannot be repositioned. But don't worry: Even though these canvas shades aren't adjustable, there is still plenty of room for artistic expression. For example, these bright orange-colored gems are full of character. Don't be deceived by their shady disposition — while fabric shades definitely provide cover, they still let in plenty of sunlight. Warning: Covering your patio with Roman shades might tempt you to recline and indulge in a glass, or two, of wine. 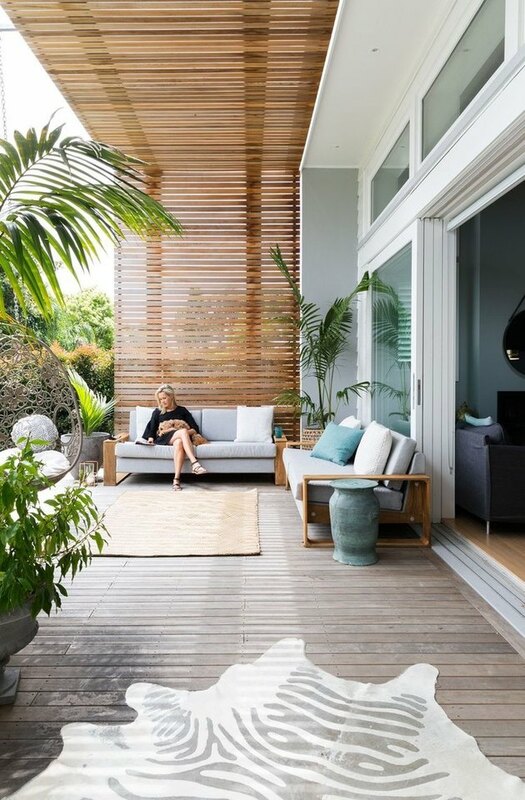 We suggest opting for adjustable shades — like the shades that Jamie Durie chose for actress Anne Heche's backyard — so you can control the amount of sunlight you wish to enjoy. Roman shades work best in areas that aren't excessively windy. 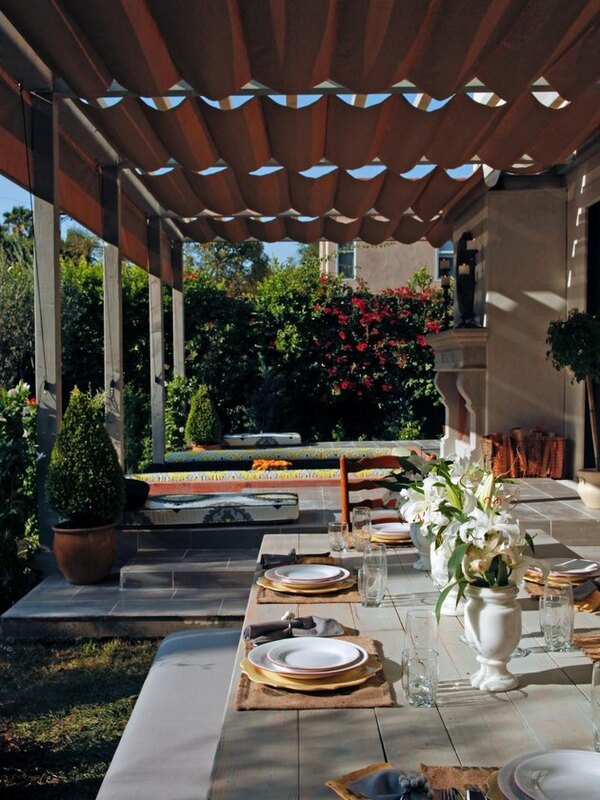 No one wants to see a strong gust of wind fly by with your perfectly styled patio cover. Though it doesn't appear nearly as often as its wood, metal, or canvas counterparts, glass is still a perfectly viable material for patio roofing. This beautifully modern patio covering protects you from all of the elements except sunlight, so don't forget your sunglasses and sunscreen. 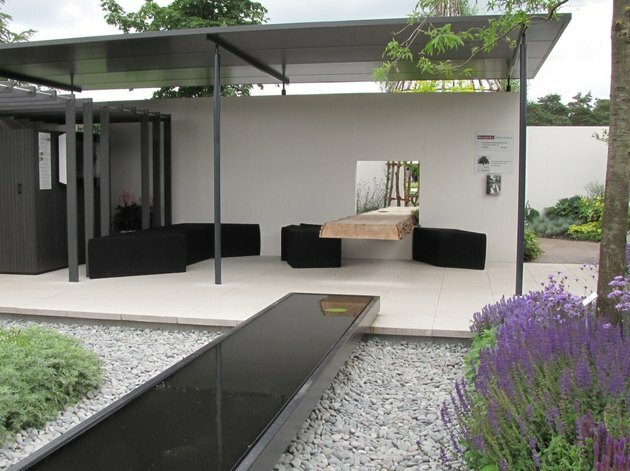 We love how the modernity of this glass roof with black frame is softened by a verdant trellis that transitions seamlessly into the lawn and pool, beyond. 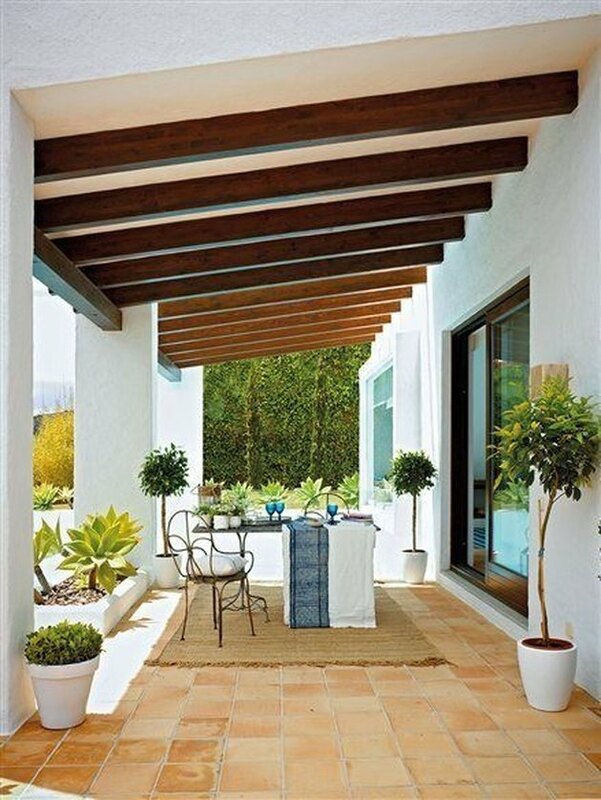 The open design of this patio is the definition of bringing the outdoors in. By simply opening or closing the large sliding glass doors, this space is instantly transformed from indoor to outdoor. A portion of the ceiling features a skylight divided by exposed beams, allowing natural light to pour in from above. In case there's any lingering confusion on the difference between a covered patio and a pergola, this is a textbook example of the latter. 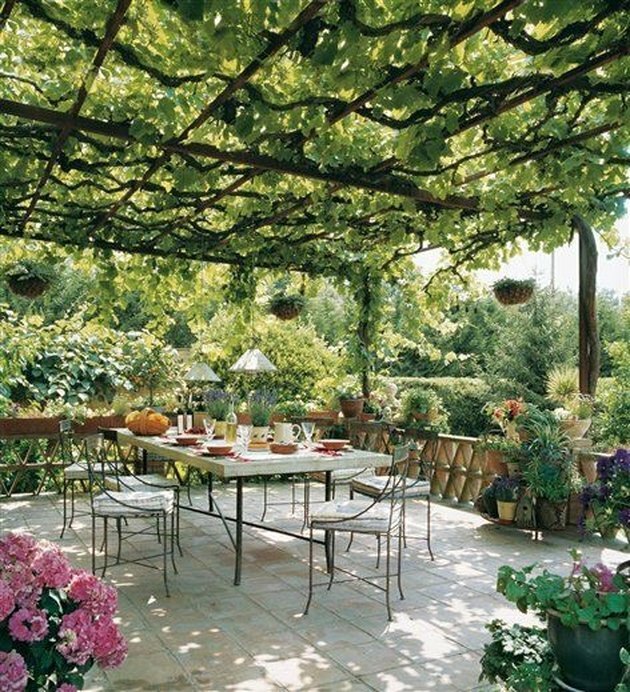 A wide-slat pergola is the best way to go whenever there's a bit of distance between the patio area and your house. 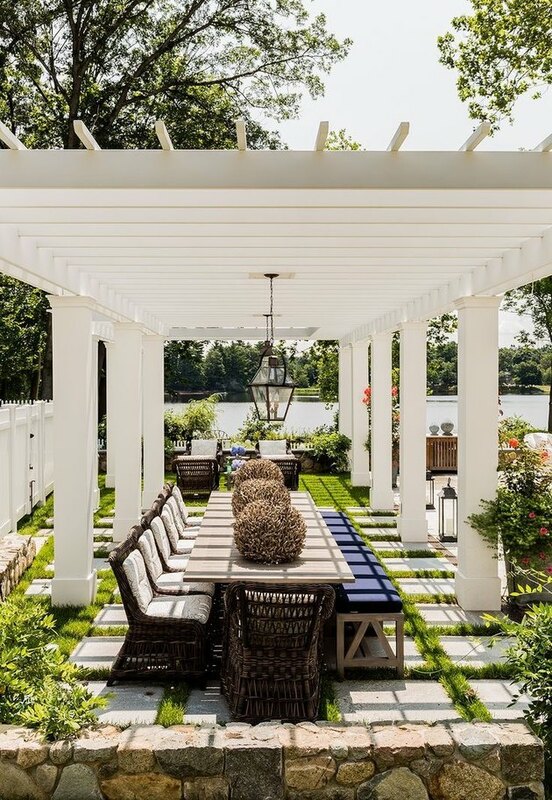 We love the way Brookes + Hill Custom Builders incorporated beautiful pendant lighting into this pergola, sure to create a bewitching ambience perfect for those summer soirees. 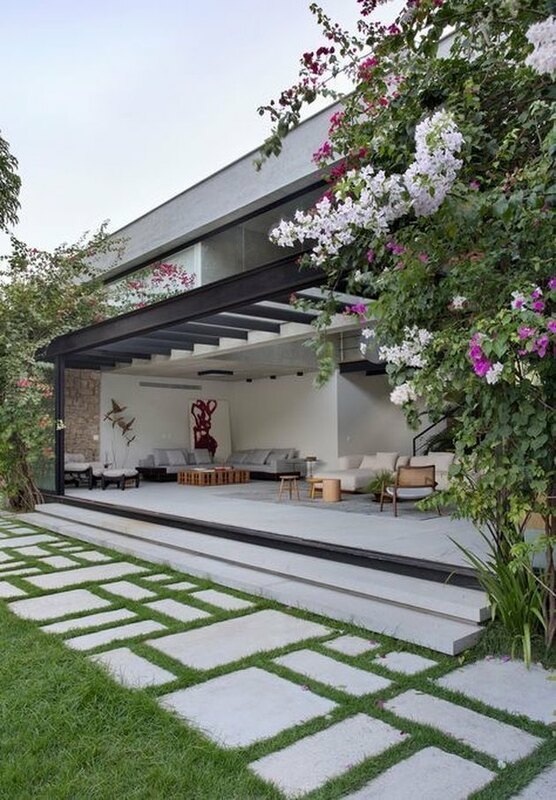 We simply love the Miami Beach vibes this modern approach exudes. Reminiscent of an exclusive poolside cabana, this wood slat enclosure provides shade and adds an element of privacy to your patio. Pair the warm wood-finished enclosure with some modern outdoor furniture, and your backyard will be the coastal retreat everyone flocks to.